With the newest member of the Marion Giant Tennis Hall of Fame Rusty Gorman watching, Marion shut out NCC rival Anderson 5-0 on Monday. Following the ceremony for Gorman, the #27 Giants made quick work of the Indians in winning for the ninth time in ten matches on the season. 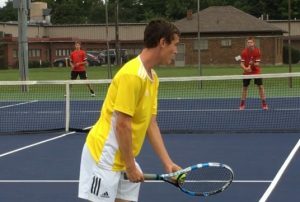 Noah Lyons won at number one singles 7-5, 6-0, Vikram Oddiraju won at number two singles 6-0, 6-1. Cole Madden won 6-3, 6-4 at number three. Both doubles teams won easily as the number one team of Jonathan Walts and Jack Fauser were victorious 6-0, 6-0 and the number two team of Ethan Eltzroth and Caleb Spitzer won 6-1, 6-0. Marion is now 9-1, 2-0 in the NCC and will travel to Yorktown on Tuesday to play Richmond at 5:30 pm.